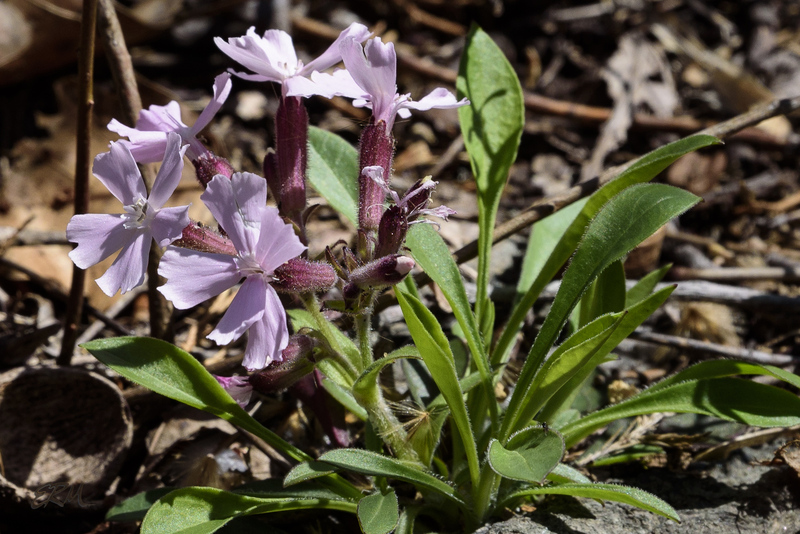 I should have written a little more about Obolaria in yesterday’s post, which I realized when someone asked a question in the comments. 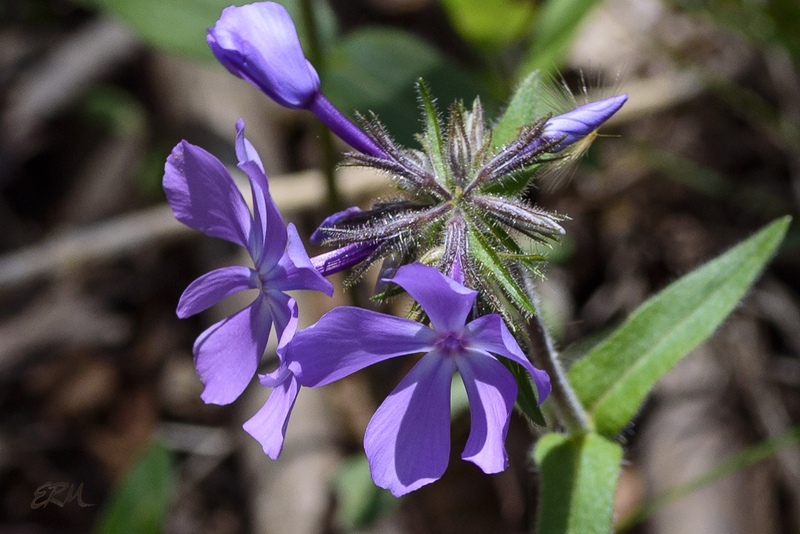 Although morphological descriptions of O.virginica exist in various floras (e.g., Radford et al. 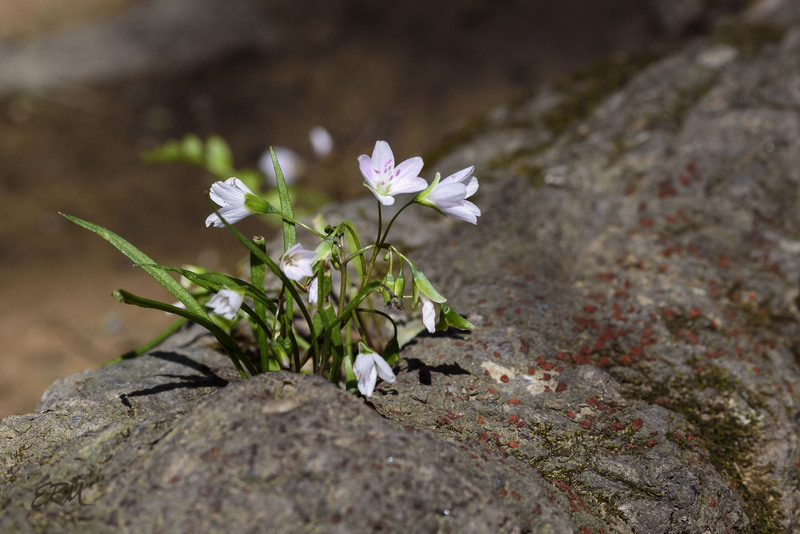 1968, Fernald 1970, Wood and Weaver1982, Gleason and Cronquist 1991), information about reproductive capacity or ecological parameters that might influence growth and development is lacking. 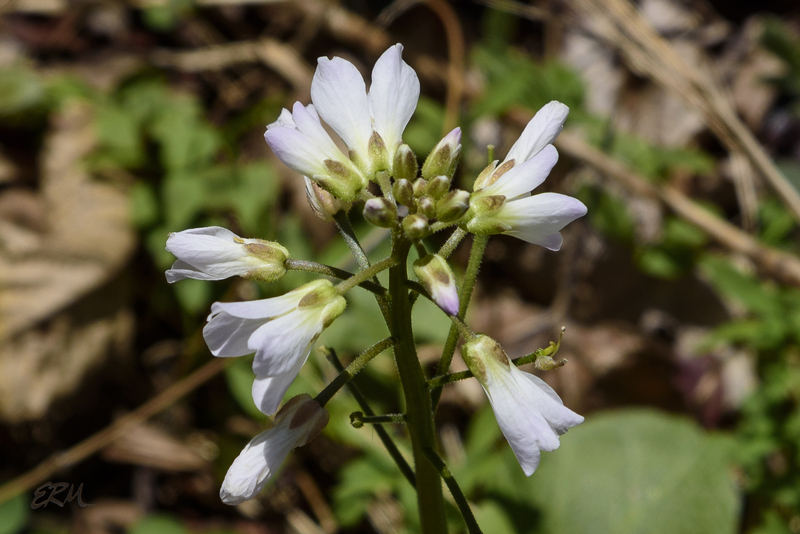 For example, no information exists about the pollination biology of pennywort, nor have there been any studies to examine basic soil parameters to determine optimal growing conditions of this species. The paper is interesting, but has no further discussion of pollinators. 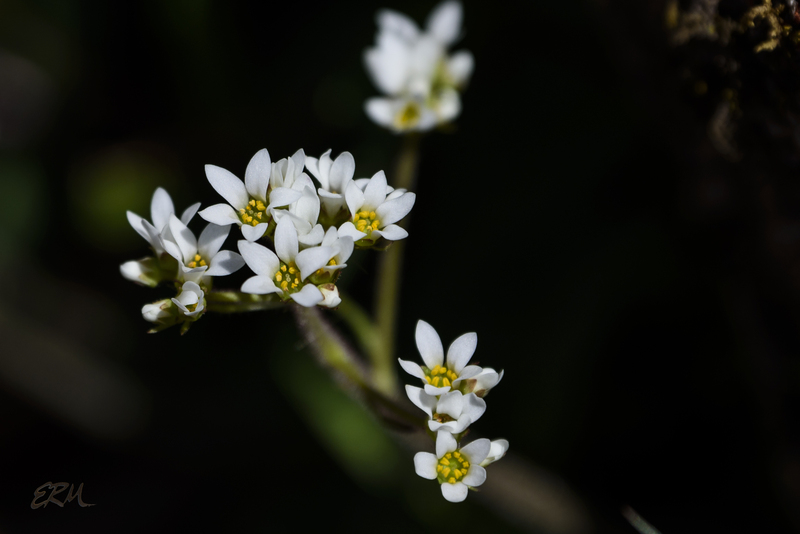 I’m not patient enough to sit and watch a stand of Obolaria to see what, if any, insects come to visit. It would be an interesting project, though. 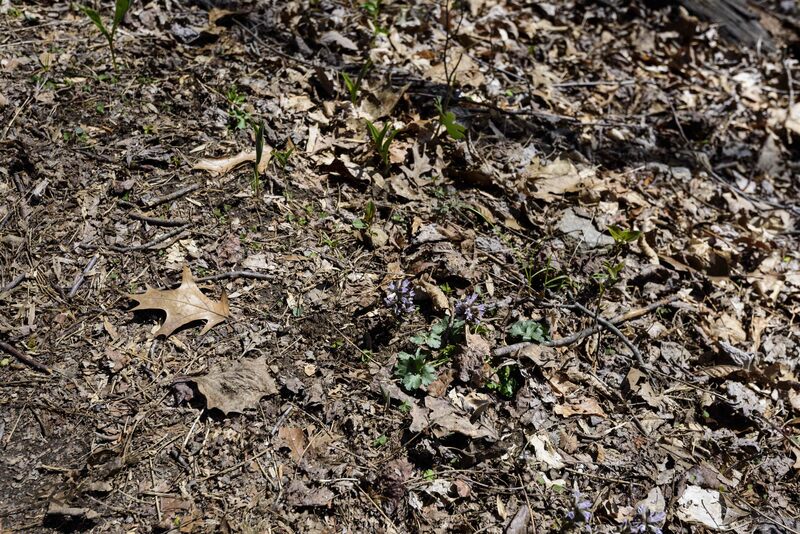 Do you see any flowers in this photo? They are there, slightly below and to the right of center. You’ll probably have to click on the photo to really see them. 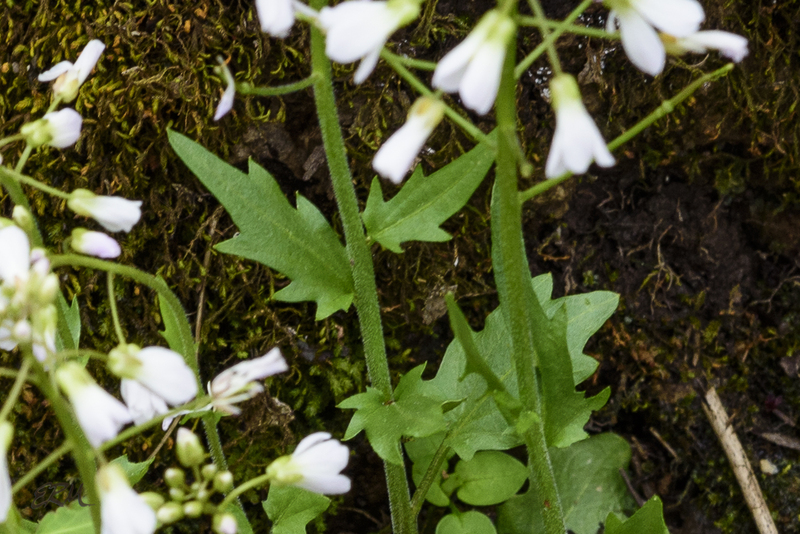 This is pennywort, Obolaria virginica, a species in the Gentianaceae. 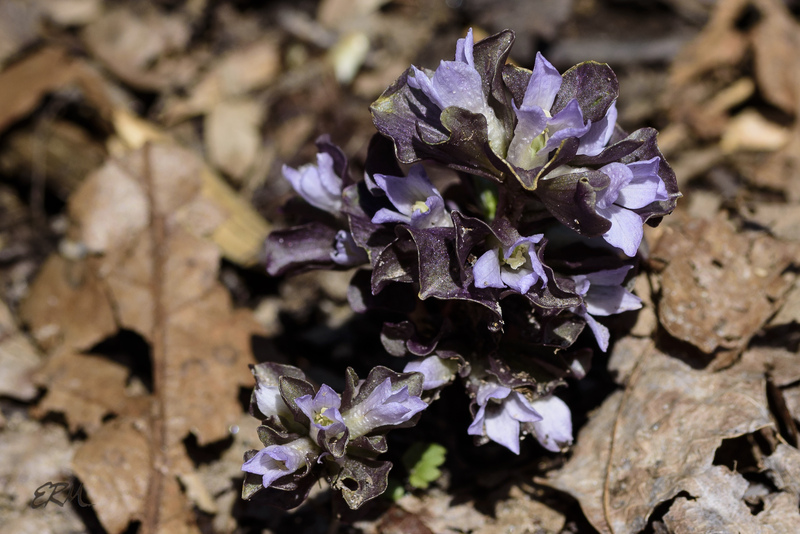 It grows on the forest floor in deep leaf litter, from Pennsylvania and Ohio south and west as far as eastern Texas. 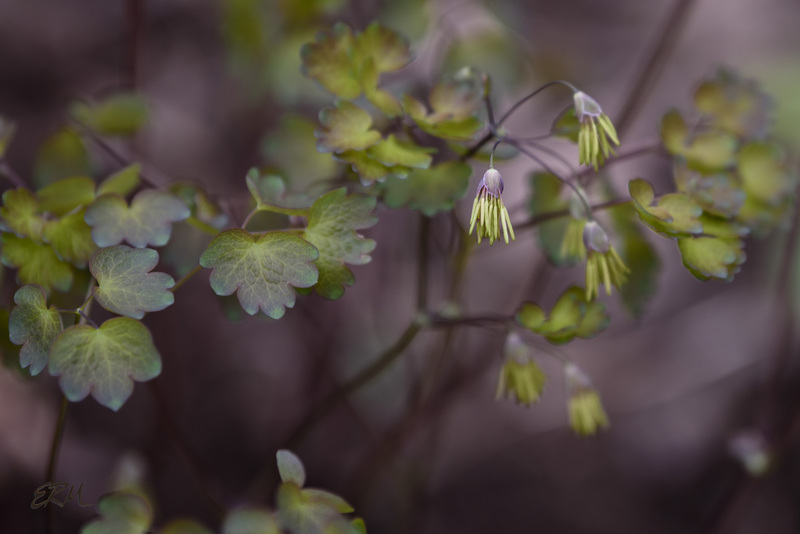 Pennywort has little chlorophyll, so it doesn’t photosynthesize much if at all; instead, it derives energy from a complex relationship with a fungus and a host plant. This relationship is called myco-heterotrophy. 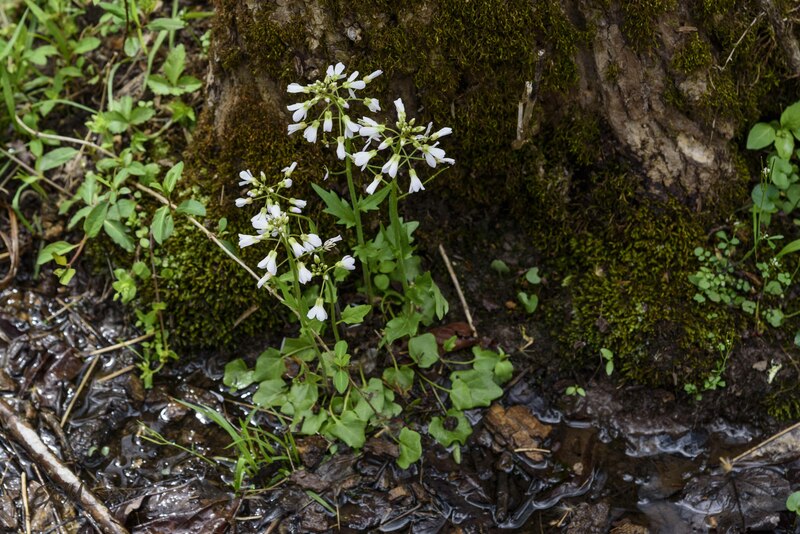 You may find some older sources that describe pennywort as saprophytic, but that concept is obsolete. 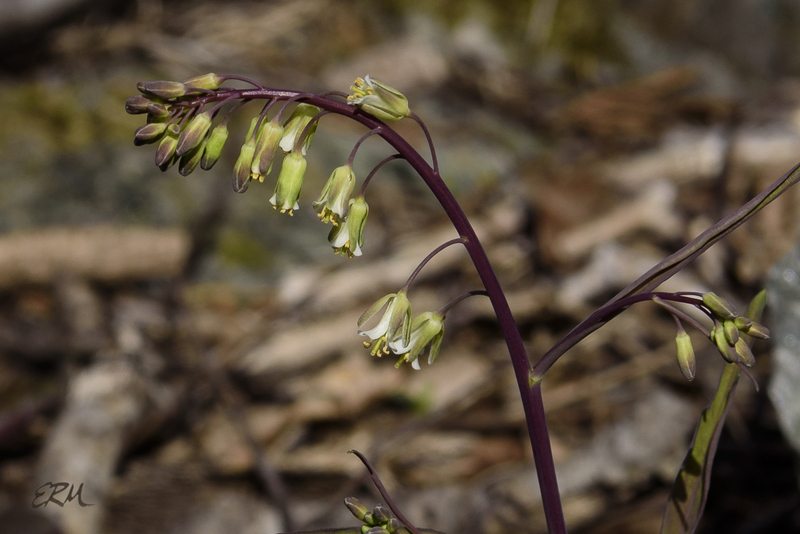 As I was researching and fact-checking, I came across a great explanation from the USDA Forest Service: What Are Mycotrophic Wildflowers? 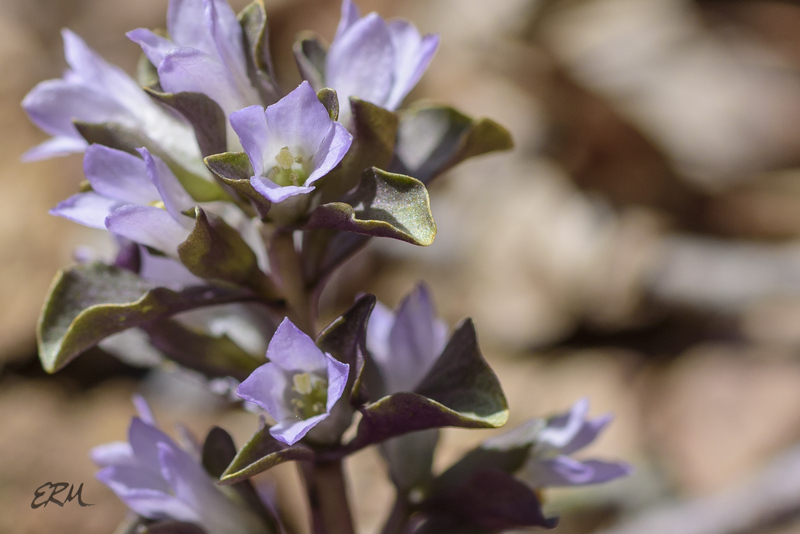 The flower color ranges from the medium purple shown here to nearly white, and the thick leaves are more purple than green. 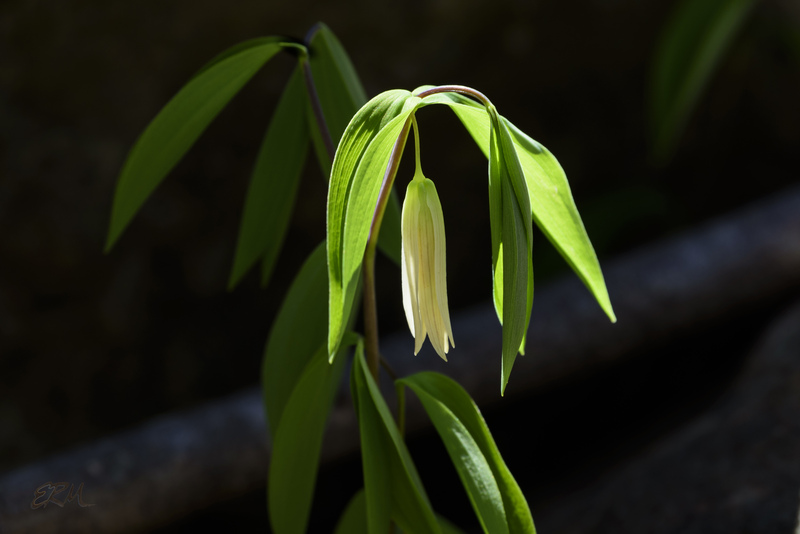 Th entire plant stands only a few inches tall. 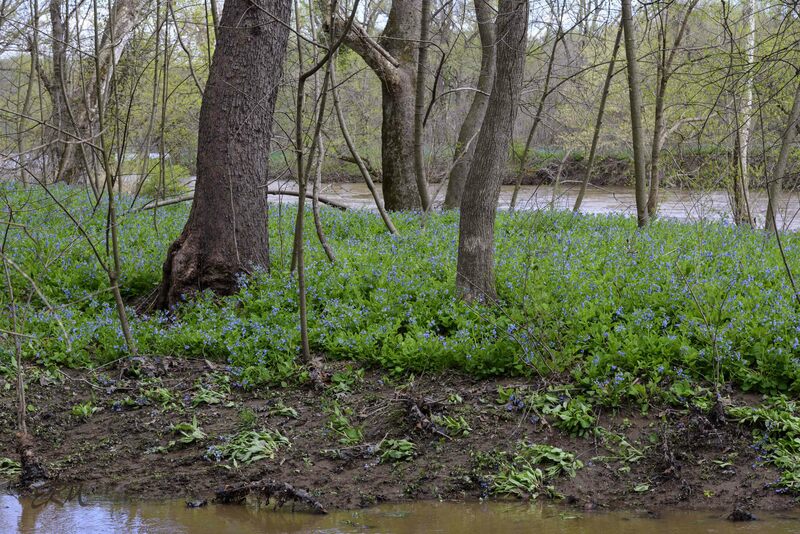 Thanks to Katie for showing me where to find a good stand of these plants. I’ve had a lot of fun the last few weeks shooting with the 70-200mm lens and the 105mm macro. A lot of pictures failed (that first lens is a beast if I’m shooting handheld in low light or a breeze), but I enjoy playing with light and shadows and I think I got some decent shots. 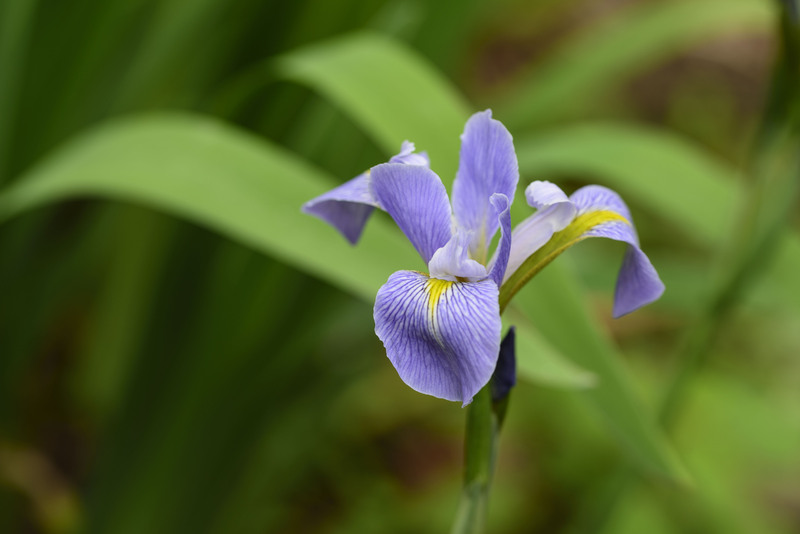 Remember those irises that I obsessed about last summer? One of the stands is located in a vernal pool that’s been dry for two years, but we’ve finally gotten enough rain for the pool to recharge. This will keep me from getting close up shots when they bloom in about a month, but the plants are looking really happy now. 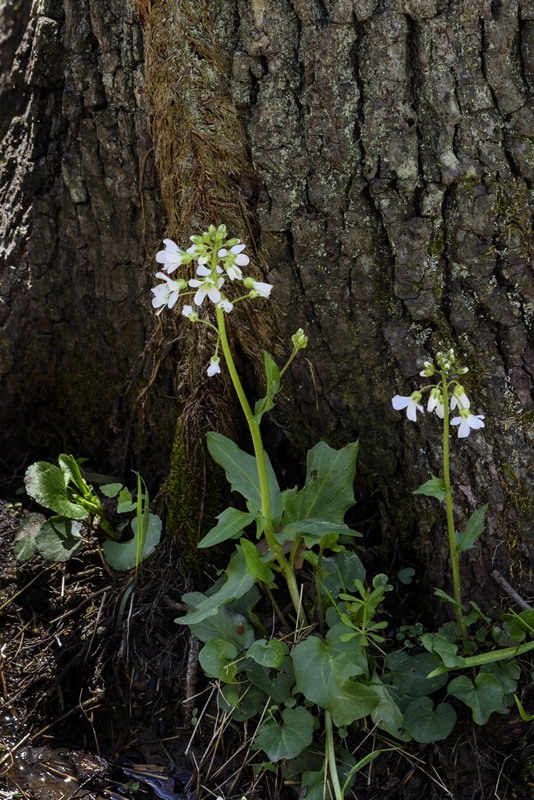 Thanks to LW’s comment on my recent post about toothworts, I was finally able to see a good-sized stand of Cardamine bulbosa, also known as spring cress, bulbous bittercress, or bulbous toothwort. 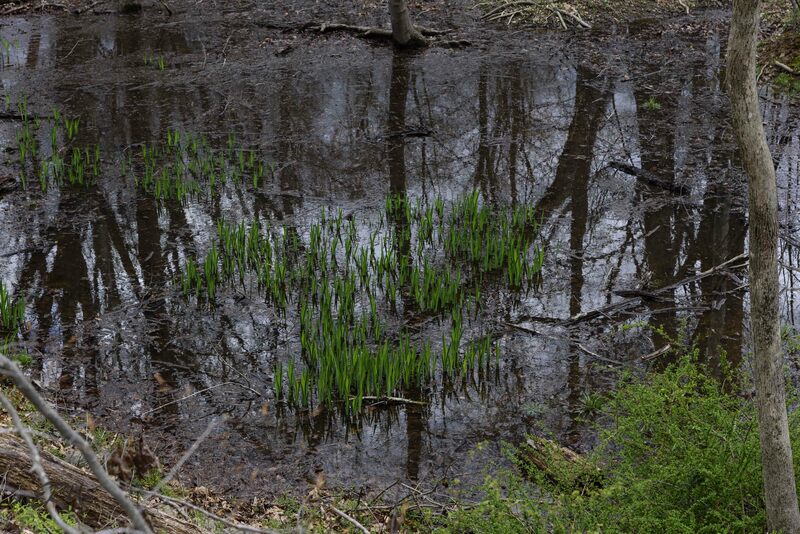 This species is a wetland obligate; here you can see it almost standing in the water of a vernal pond. 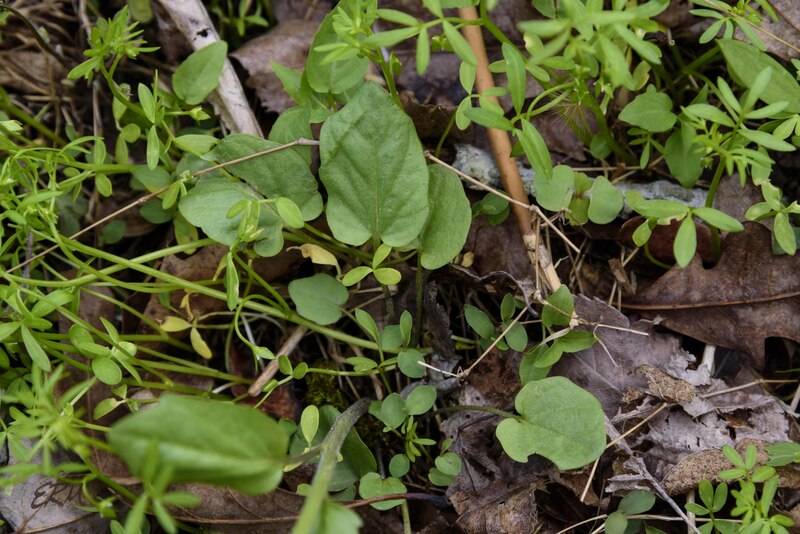 The cauline (stem) leaves are entirely different from the slender and cut-leaved toothworts’. The basal leaves are, too. 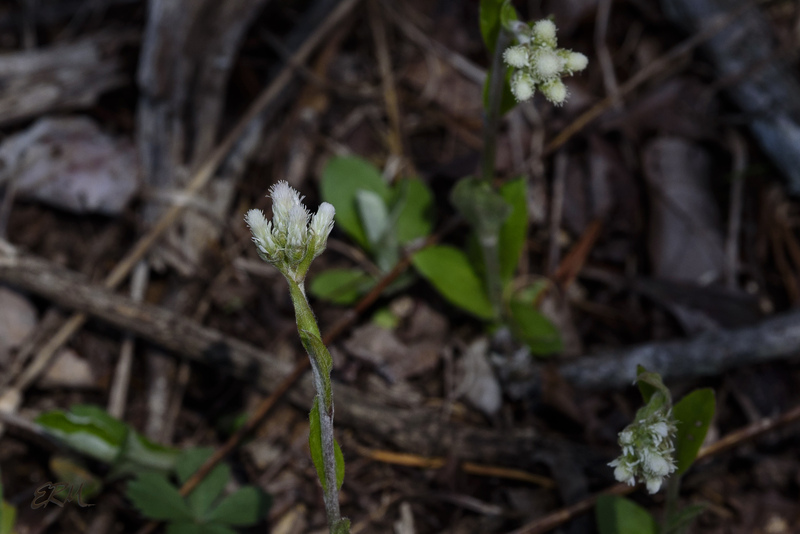 The flowers and inflorescence look much like the toothworts, though. 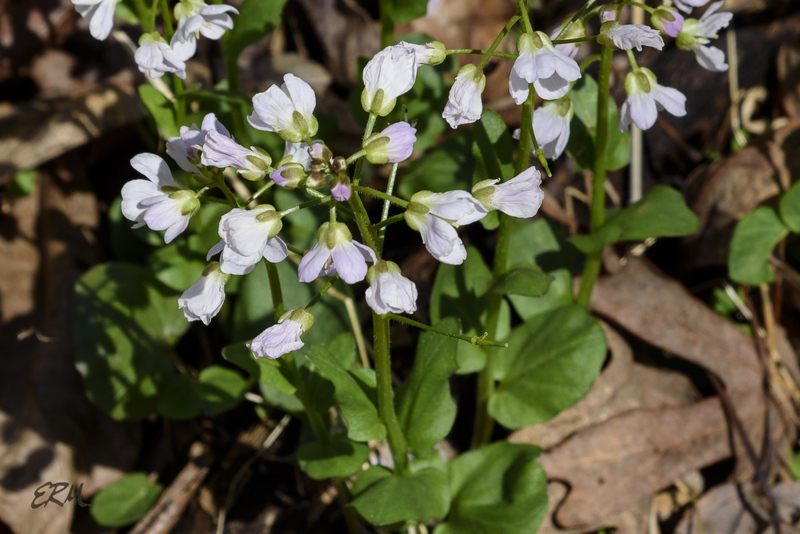 Another Cardamine species found in Maryland, limestone bittercress (C. douglassii), is almost identical to spring cress, but it species has hairy, dark purple sepals rather than the smooth, green sepals seen here. 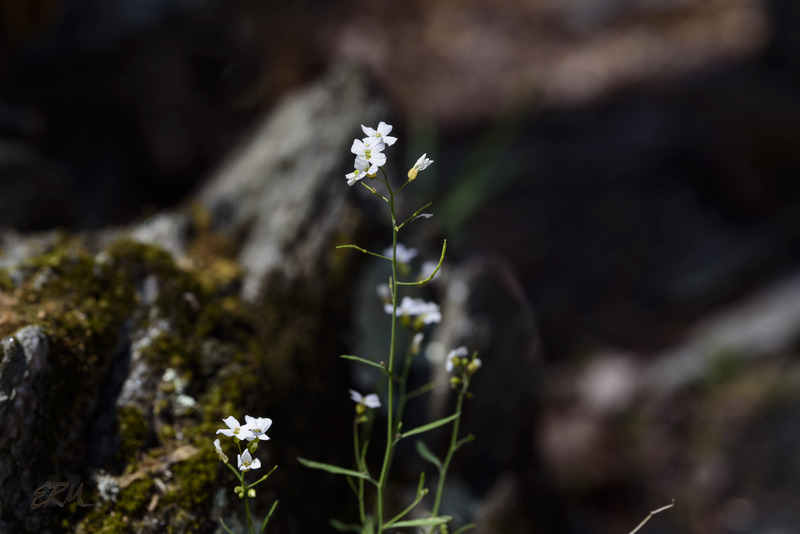 Spring cress is native to the eastern US, where it ranges from Florida to New Hampshire (where it’s endangered) and into the Great Plains from Texas to Minnesota. River levels have been pretty high, and the vernal ponds are more full than I’ve seen them in several years, but I suspect the groundwater level is still pretty low. We need rain. Or it may be that I need rain. With this compressed season, I’ve been out almost every day shooting, which means I have a backlog of several hundred photos to process and many ideas for blog posts to write. But those things won’t happen until the weather forces me to stay inside. 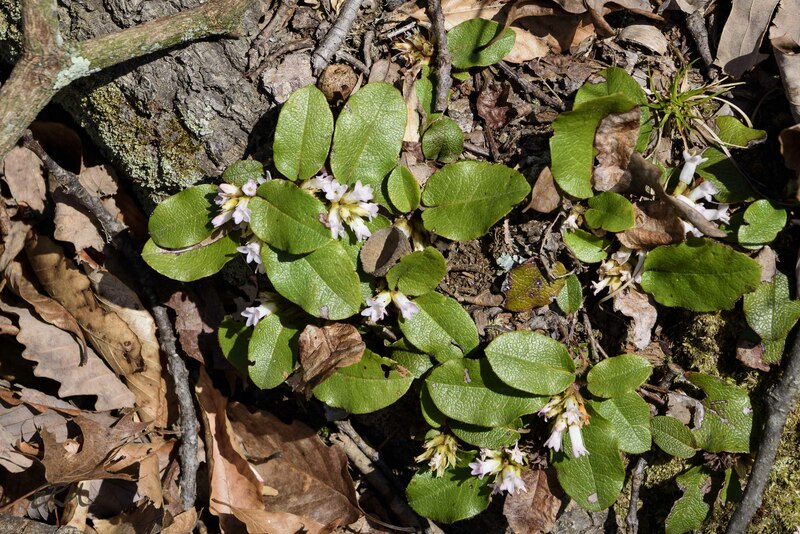 The initial tide of spring ephemerals is ebbing: while early saxifrage, golden ragwort, and toadshade are near their peak, Virginia bluebells, toothworts, Dutchman’s breeches and squirrel corn are all past theirs, and it looks like bloodroot, trout lily, and harbinger of spring are done. 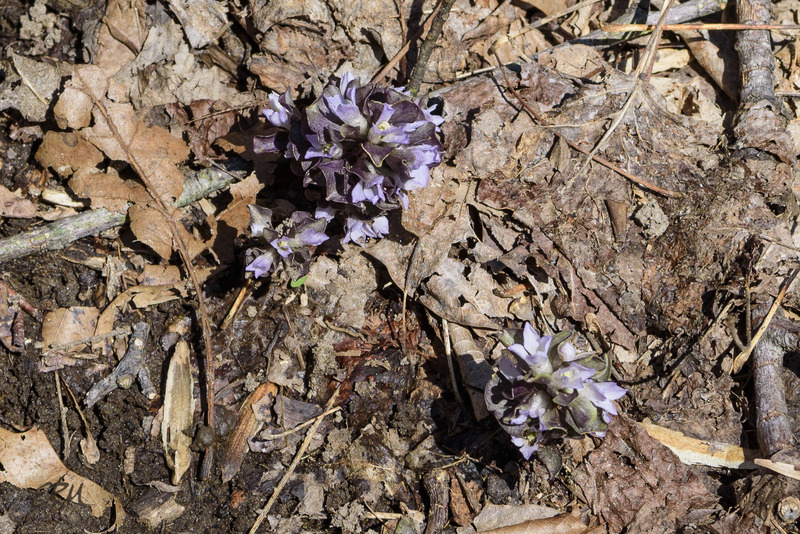 Round-lobe hepatica seems to be done near the Potomac, but is still going strong up at Rachel Carson Conservation Park. 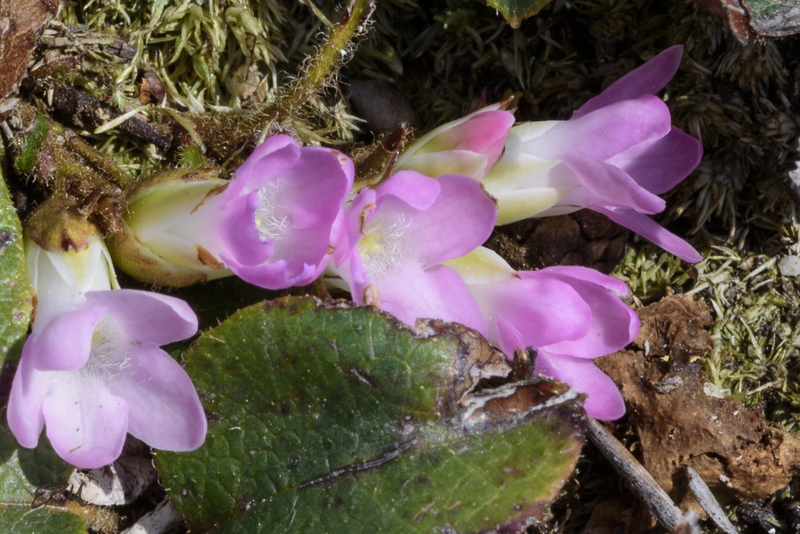 And speaking of RCCP, pennywort is blooming there now, and the pinxter azaleas are well in bud. 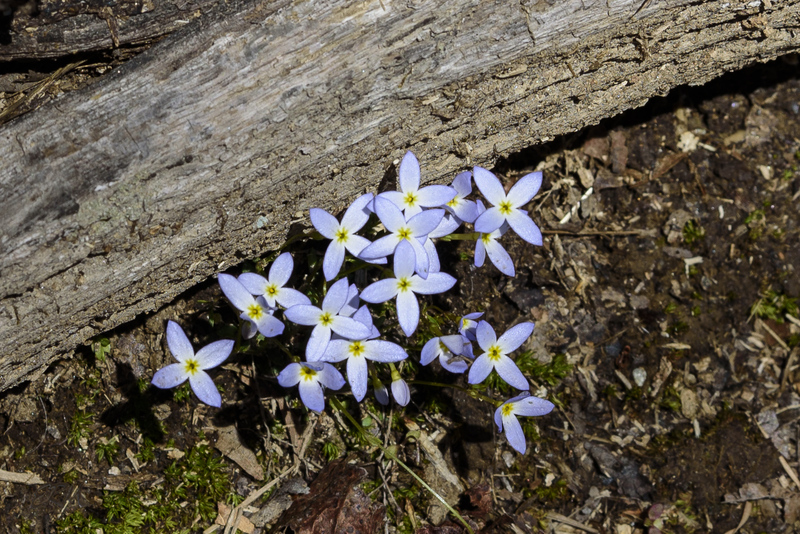 The second wave of spring flowers is well under way in the greater Carderock area. 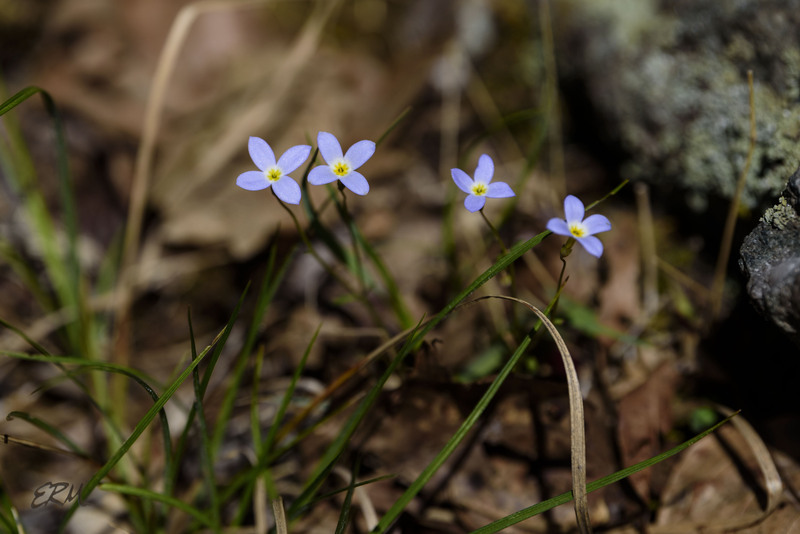 Recently I’ve spotted blue, yellow, and white violet species, sessile bellwort, yellow corydalis, azure bluets, and wild pinks. 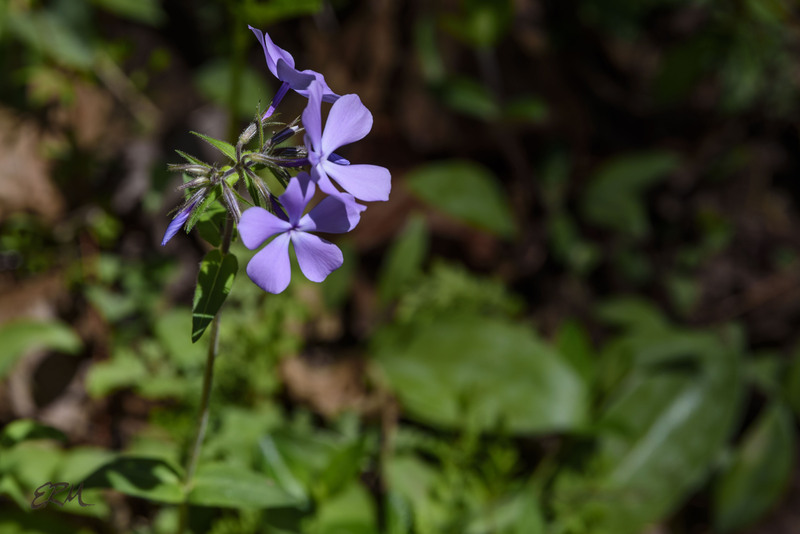 Wild blue phlox is close to peak, and so is rue anemone. 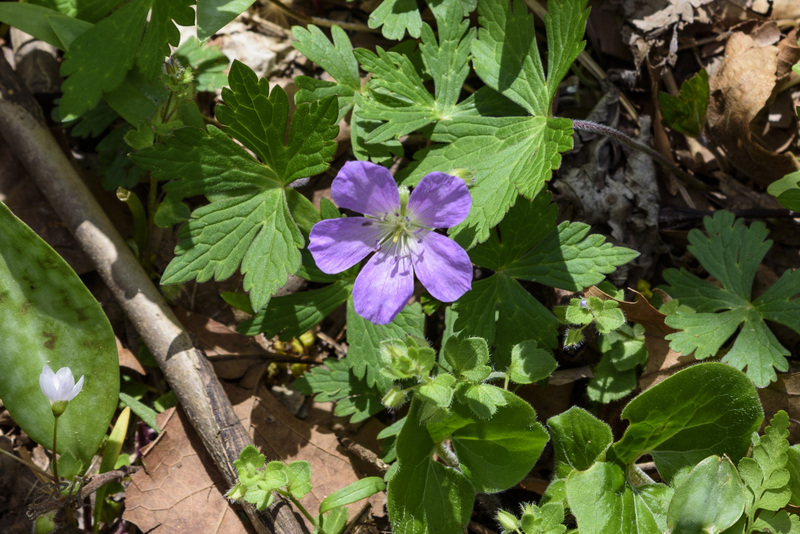 Dwarf cinquefoil, plantain-leaved pussytoes, wild geranium, and jack-in-the-pulpit are blooming. Trees are blooming, too. 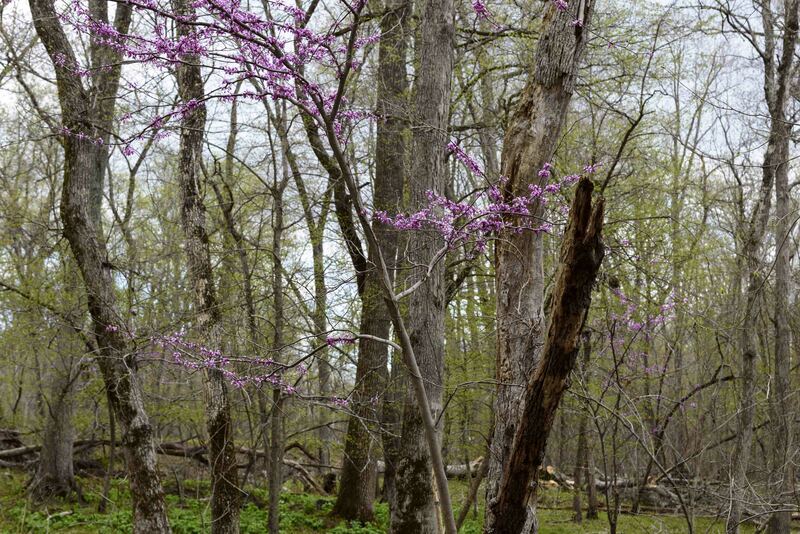 Redbud flowers are open, pawpaw buds are swelling. 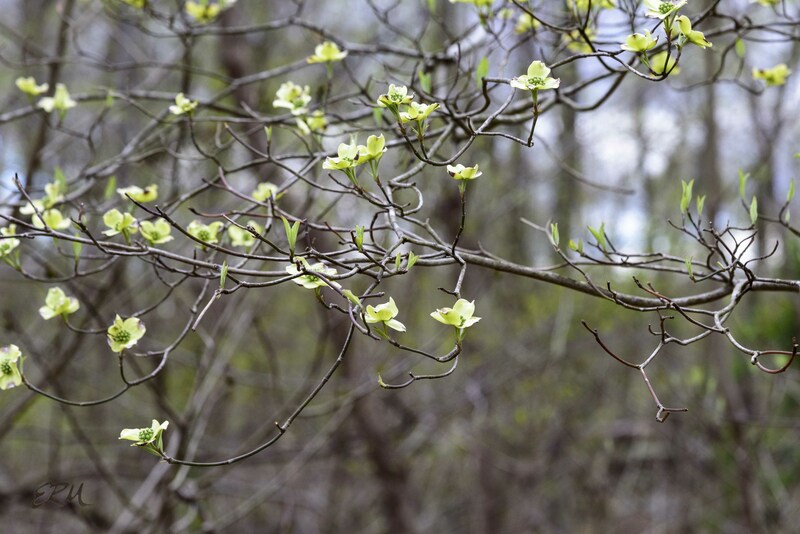 Dogwood is just getting started. 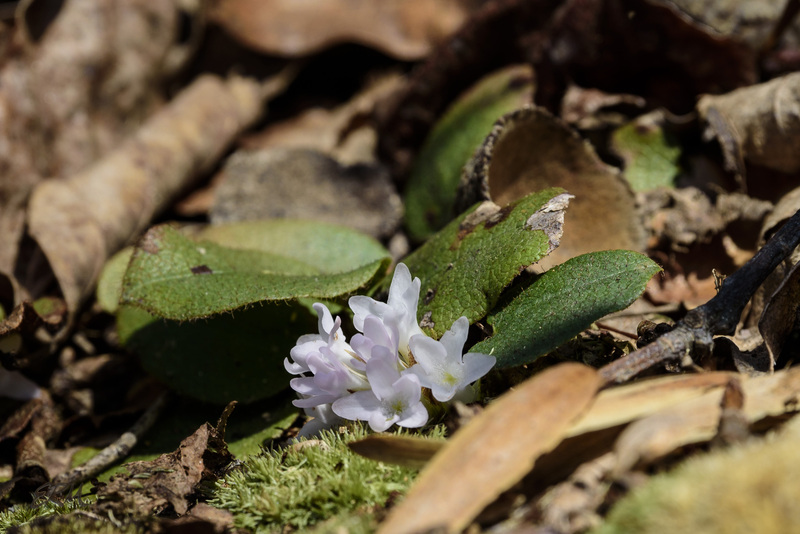 After a few years of trying, I finally caught trailing arbutus in bloom on Friday, April 13. This is an uncommon species. 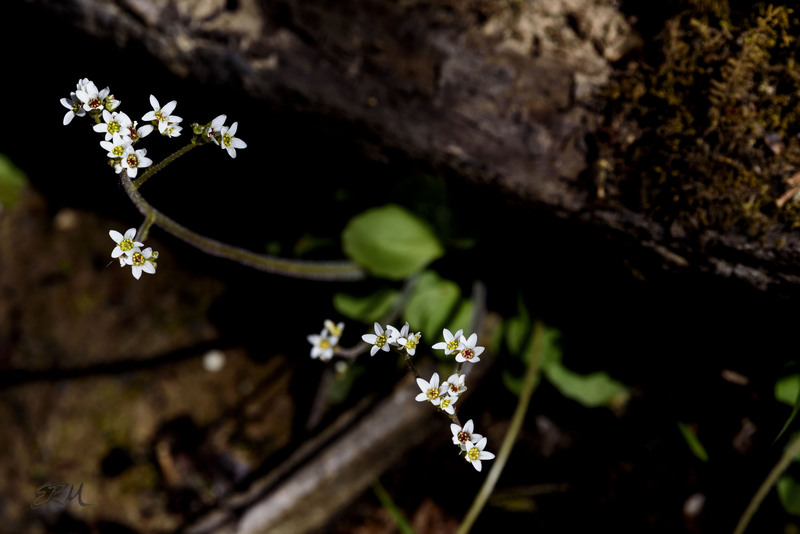 Although it has a wide range (most of the US east of the Mississippi, and the upper Midwest ) it isn’t found in large numbers anywhere. That might be because of its rather specialized growing requirements: moist but well-drained acidic soils. 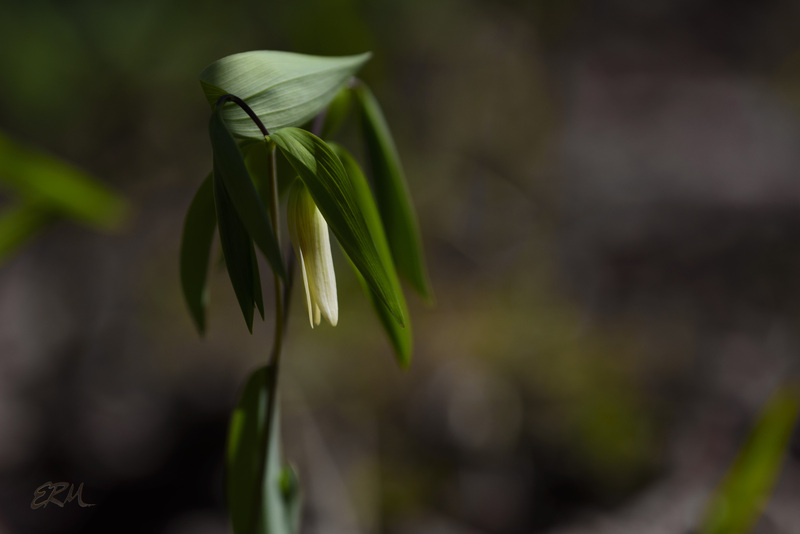 It likes undisturbed open woodlands, especially rocky slopes, where leaf litter doesn’t collect. 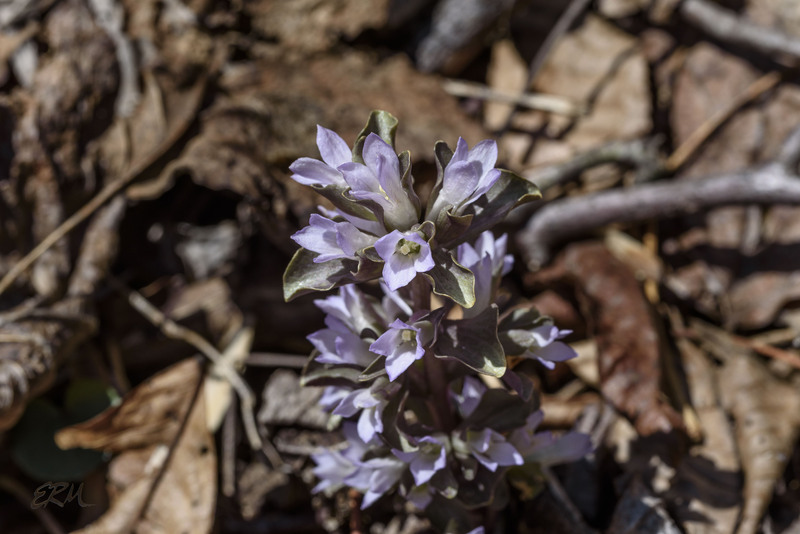 Look for it whenever you see other species in the Ericaceae, like mountain laurel, blueberry and deerberry, and spotted wintergreen. 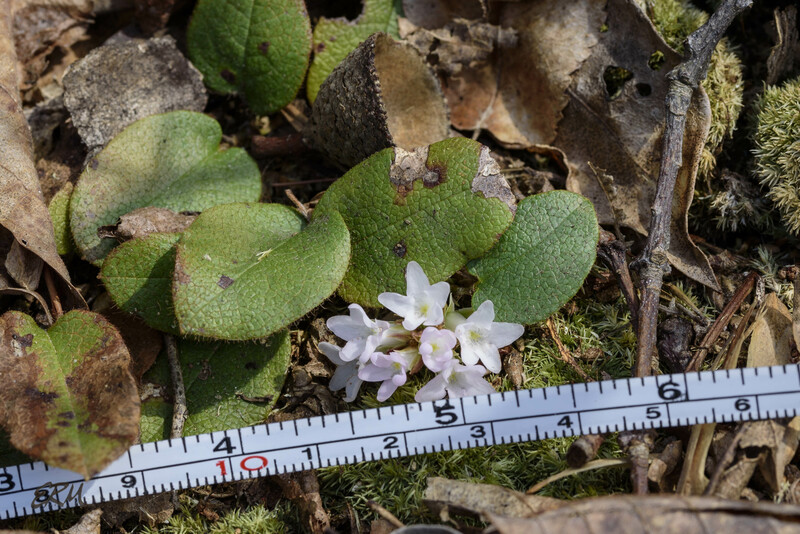 Many authors recommend against trying to grow trailing arbutus in the home garden: it is difficult to propagate, leading to poaching concerns; also, it is suspected that, like other species in the Ericaceae, it might have specific mycorrhizal associations without which it simply cannot grow. 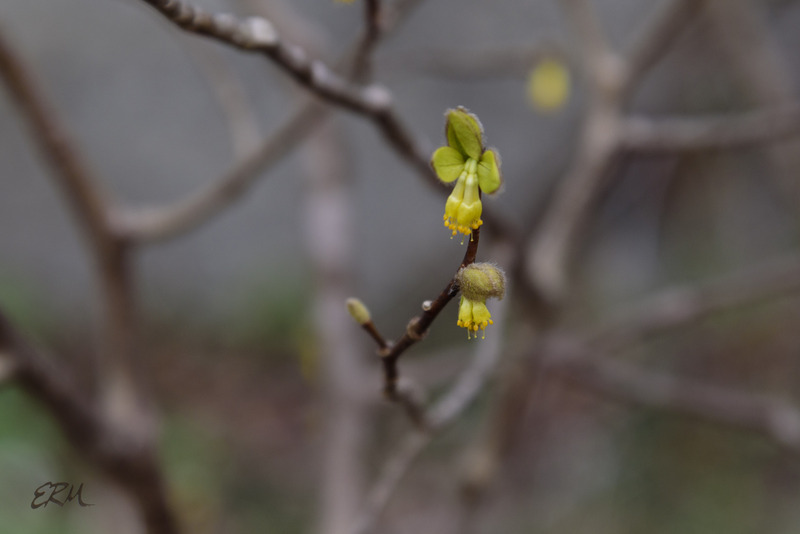 It’s certainly a belly flower, but also technically a shrub. 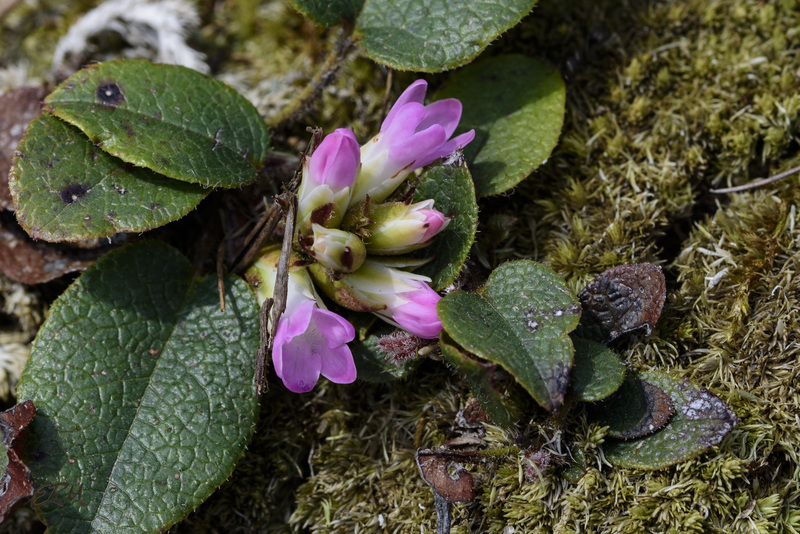 Epigaea repens stays low, the tough evergreen leaves lying flat along semi-woody stems that creep over the ground. 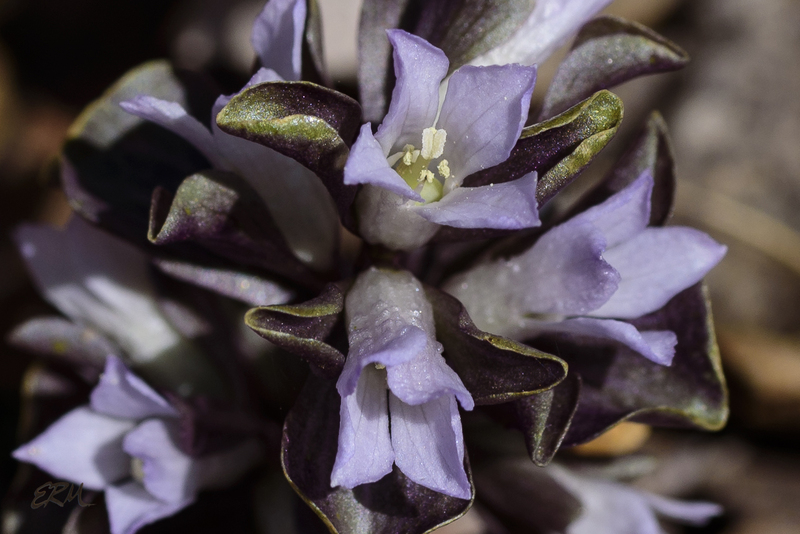 Also known as mayflower, this species has a delightful scent, but you have to get your schnoz right up in there to smell it. 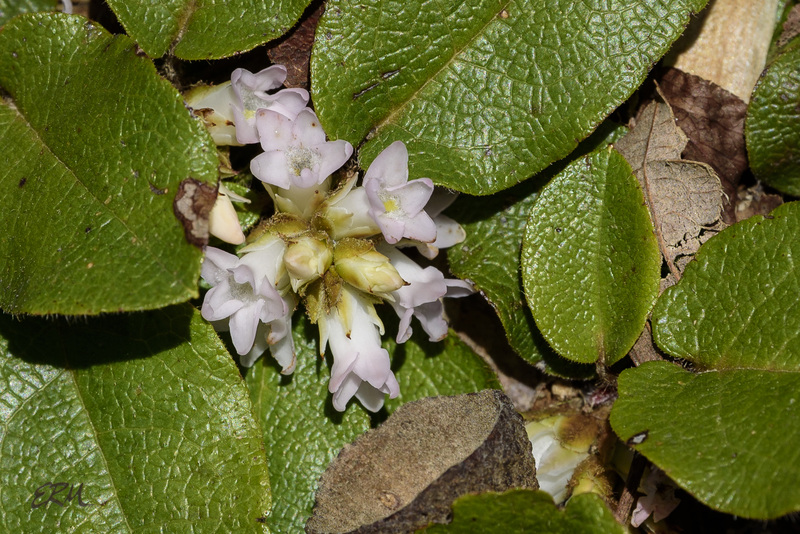 Trailing arbutus is endangered in Florida and exploitably vulnerable in New York. It’s the state flower of Massachusetts and the provincial flower of Nova Scotia. 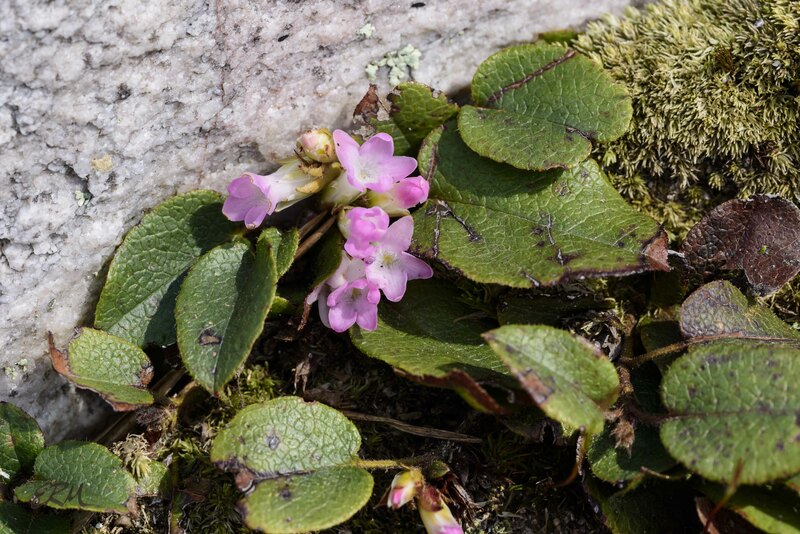 These pink-flowering and white-flowering specimens were blooming along a bank under mountain laurel (Kalmia latifolia) on Sugarloaf mountain.